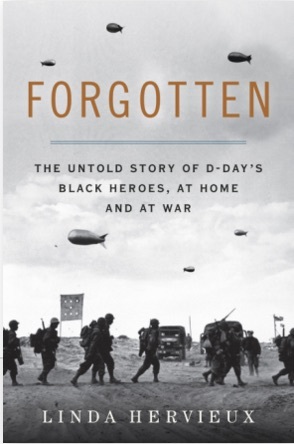 Linda Hervieux, a fellow American living in Paris, journalist and photographer, recently finished her impressive first book, Forgotten: The Untold Story of D Day’s Black Heroes, at Home and At War. Not many first-time authors are told their work is “utterly compelling” by Tom Brokaw. Congratulations, Linda! This is not a book review. That’s to come soon! I have not finished the book yet for the simple reason that I could not bring it home over the holidays or it would spoil the surprise, as I was giving signed copies to my family as Christmas presents! I did, however, hear Linda speak about the book and her journey in writing it at the Overseas Press Club in New York, and it was an exceptional talk. My family also went to hear her speak in Linda’s native Lowell, Massachusetts, and said she was “fantastic”. And now those of you in Paris will have the chance to hear Linda speak at the American Library at 7:30 p.m. on February 2, 2016! Admission is free! For those of you in the U.S., Linda is also hosting a number of events during the month of February, in celebration of Black History Month, where she will discuss the book and the black soldiers’ experiences. See the events calendar here. Below is a fuller description of the book in Linda’s own words. Stay tuned for my book review of Forgotten, coming soon! Forgotten: The Untold Story of D Day’s Black Heroes, at Home and At War (Harper USA, October 2015) tells the story of the only combat unit of African Americans to land in Normandy on June 6, 1944. They were part of a segregated Army that considered them second-class soldiers, and even lesser men. It is the story of this battalion’s journeythrough Jim Crow America, to unexpected freedom in Great Britain and, finally, to war. History has neglected these men: D-Day movies do not show them and most history books do not mention them. You can see a short video trailer here.